Two weeks ago, Americans celebrated Thanksgiving in a variety of ways. Most had large dinners with families, many went on a televised football binge, and others watched the Macy*s parade and/or the Philadelphia dog show on NBC. 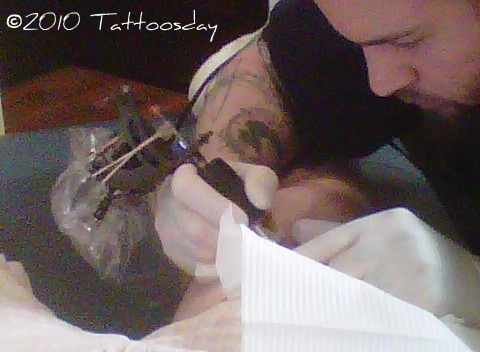 I, of course, nursed my new Thanksgiving tattoo. 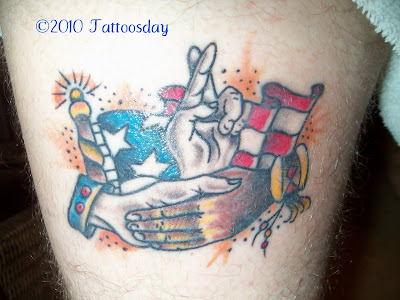 For those of you just tuning in, late November found me being thankful for the good people at SkinActives, for sponsoring a little contest we had here to choose which of these tattoos that I should get inked to commemorate the holiday (and Hand of Glory’s cool Thanksgiving Special). Why would a skin care company sponsor such an endeavor? Well, they wanted me to sample their Troll Skin Tattoo Aftercare product and I suggested that the best way to do so would be to have a fresh tattoo on which to use their product. The rest, they say is history. Immediately after the agreement was reached, however, I had some concerns. What if Troll Skin was not something I could positively review? Into what kind of moral conundrum had I wandered? I assured myself that the Troll Skin Aftercare folks wouldn’t be sending out samples to an inkblogger if they weren’t 100% confident in their product. Fortunately for me, no such moral dilemma surfaced, for I found the Troll Skin product to do remarkably well. In fact, I am so pleased with it, I intend to use it for all future tattoos. 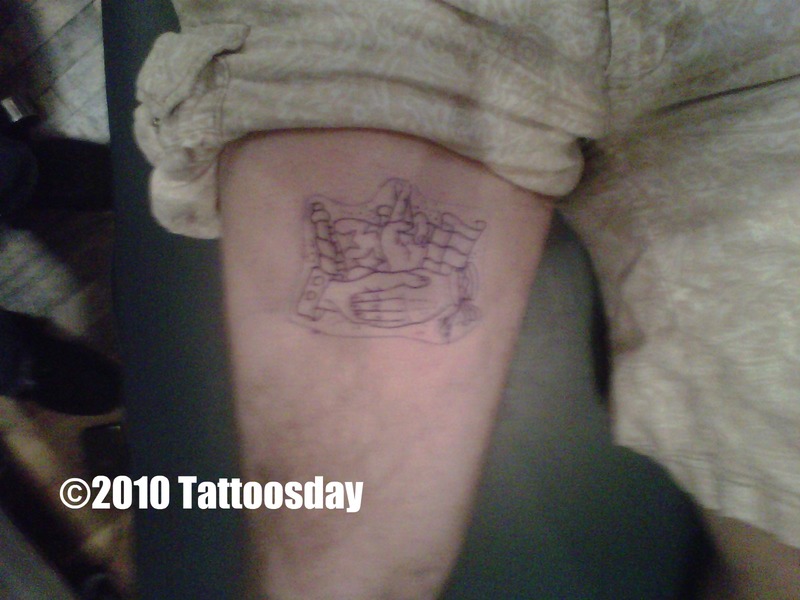 My most recent tattoos were treated the same way. Aquaphor ointment for the first 72 hours, and then Lubriderm cream until the tattoo had fully healed. This regimen seemed to work for me, but it has its drawbacks. For example, whatever clothing you have that may cover the tattoo that has been treated with Auquaphor, bid it farewell. 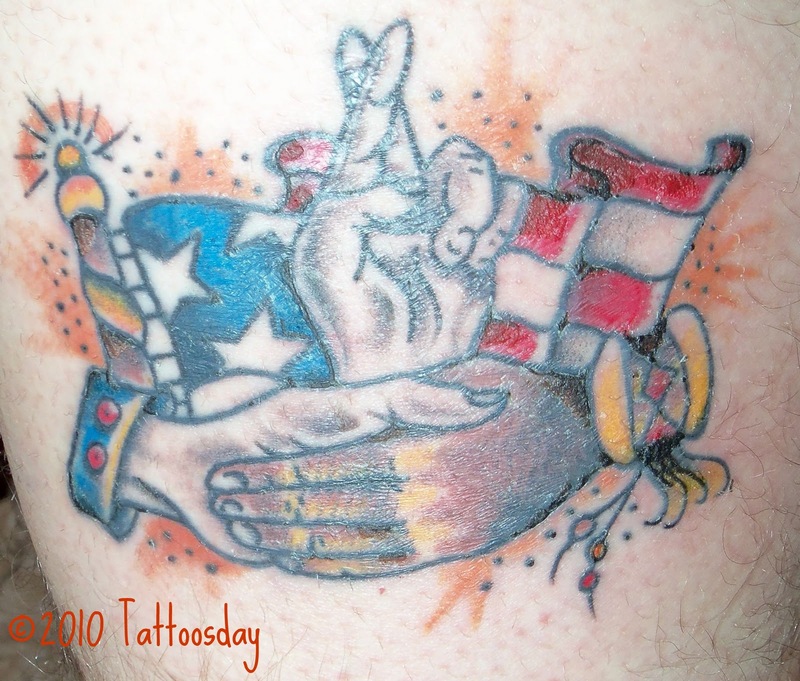 The spot of clothing near the tattoo absorbs the ointment and is discolored permanently. It is also a thicker, gooier substance. of the cream, but it was 90% neater. No gooey mess to confront, and no clothing had to be sacrificed. This is because the product is water-based, so it absorbs better into the skin and less into the fabric around it. 2 Weeks, Healed and Vibrant! 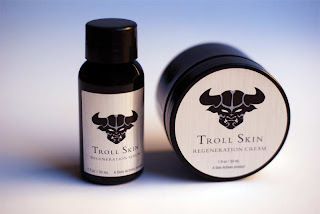 I also like that the Troll Skin Aftercare cream comes in a little round tin, rather than a tube or cap-top bottle, which has the potential to open or break in transit. The biggest drawback? Perhaps the price. Suggested retail is $27.50. However, considering this is a treatment for protecting a lifelong investment that can cost hundreds, if not thousands, of dollars to obtain, it’s a veritable bargain. Consider also that my old treatment involved Aquaphor (approximately $8) and Lubriderm (also $8), you’re only paying a little bit more, for what I deem to be a superior treatment. Troll Skin also comes as a serum (MSRP $14) which is recommended for post-healing for “continued skin health and to maintain the vibrancy of the artwork”. Readers of Tattoosday know that I don’t generally endorse products here, aside from an occasional book review. However, I would certainly recommend this product for tattoo healing. I know, I know, people are generally overprotective of their new tattoos and don’t like to change their healing regimens. Nonetheless, why not embrace a product if it’s an improvement to an old process, and why not spend a little more to protect something you will carry proudly for a lifetime? For more information, visit the Troll Skin website at www.TrollSkin.com and SkinActives Scientific. Thanks again to the good people at SkinActive for their cooperation with this project!